You read that right, a pot pie soup. This isn’t so much of a soup than a chowder or stew. It’s the same texture and consistency of a pot pie filling. It tastes exactly like a pot pie filling. I love this. I may or may not have eaten 3/4 of this soup. It reheats beautifully and is absolutely full of flavor. A bonus to this recipe is you can add chicken to it if you’d like to. Just add some raw chicken to the crock pot and follow the recipe other than that. The recipe couldn’t be easier, and it is very filling and delightful. If you like pot pie, you are in for a treat. You may be wondering where the pot pie crust is. Well, I made absolutely amazing puff pastry breadsticks to go with this soup. I’ll post them tomorrow. You will not believe how delicious this pot pie soup is, but with the breadsticks it becomes one of the best dishes I’ve ever made. This is a very easy recipe to follow. First, peel and cut your russet potatoes. 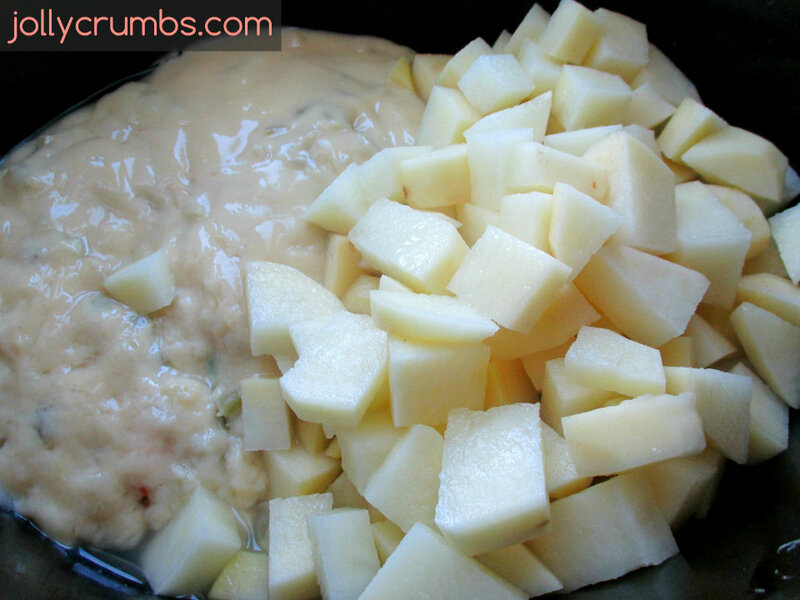 Try to cut the potatoes into about the same size of cubes or chunks. This will allow them to cook evenly. Add in the frozen vegetables, potatoes, two cans of condensed soup, and water into the crock pot. You can use whatever kind of condensed soup you want. I used celery, but mushroom or chicken would work as well. Stir together all the ingredients in the crock pot. If you want to use chicken, you can add 2lbs of raw, boneless chicken cut up into cubes similar to the potatoes. You can just cook the chicken along with the pot pie ingredients. This soup is seriously delicious without the chicken, but I won’t be too mad if you want to add the protein. Set the crock pot on HIGH for 6 hours, or until the potatoes are soft and tender. If you use chicken, it should be cooked all the way through at the 6 hour mark. You can serve it immediately, let it cool slightly so it thickens a little, or you can thicken it yourself. The soup will thicken as it cools, but if you want it thicker, you can add in the cornstarch and water. Mix the cornstarch and cold water together. Add this into the crock pot. Stir until completely combined. Put the lid back on the crock pot and let it cook for about 10 minutes. It will have the consistency of a pot pie filling if you go this route. This soup is amazing. I truly love this soup. I had it for lunch for two days in a row. It tastes exactly like a pot pie filling. I didn’t actually think it was going to be so delicious, but oh boy was it. I made puff pastry breadsticks to go with this to act as a crust. This soup combined with the breaksticks is perfect. 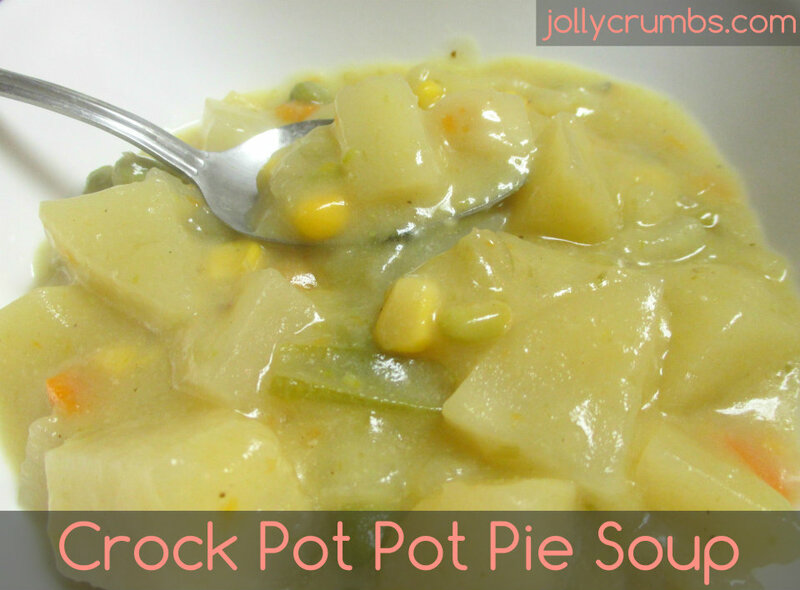 It tastes exactly like a delicious pot pie, but it is so much better for you. I will no longer miss pot pies. This is one of the easiest recipes to make, so it easily will satisfy anyone’s pot pie cravings. 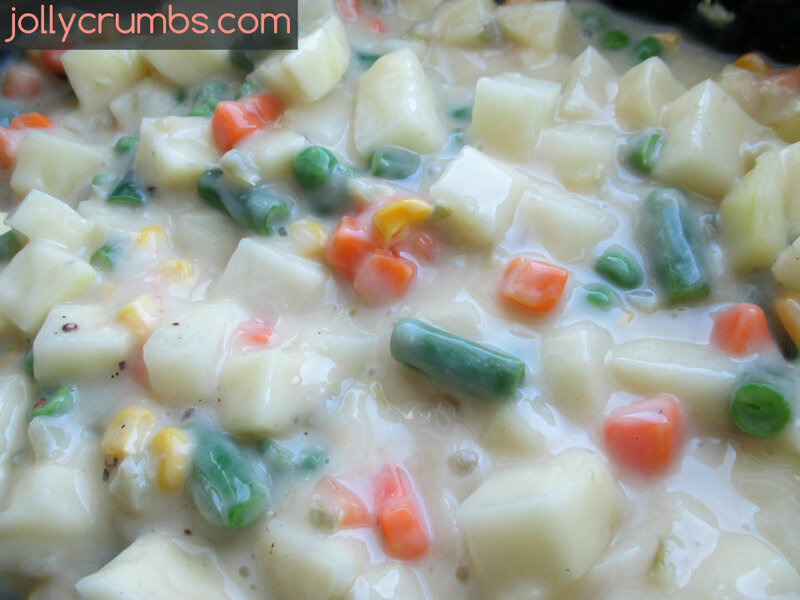 Place frozen vegetables, cubed potatoes, soup, and water into the crock pot. Stir until everything is well combined. Set your crock pot on HIGH for 6 hours. The potatoes should be soft and tender. Serve immediately, or let it cool and thicken slightly. The soup will thicken as it cools, but if you want it thicker, you can add in the cornstarch and water. Mix the cornstarch and cold water together. Add this into the crock pot. Stir until completely combined. Put the lid back on the crock pot and let it cook for about 10 minutes, or until thicker. You can add in 2lbs raw, boneless, skinless chicken breasts(cut up into cubes) if you would like to. Just throw them into the crock pot and follow the recipe other than that. You can sub in any cream soup you’d like. You can use cream of mushroom, celery, chicken, or another option you like. The cornstarch and water is completely optional. I added it into my soup, and it became very much like a pot pie filling. If you want a thinner soup, you do not need to add the cornstarch to this. It will thicken as it cools. Another great recipe I will be trying soon! After just posting my comment, I read the others. Were Michael and Marjorie really joking with us? There are just some things that are too sacred to joke abt;#&o8230uIf so, for shame!!! This was delicious….everyone loved it! I served it with the puff pastry sticks and it was excellent. I added almost 2 lbs of chicken (of course) and it was thicker than I had imagined. Next time, I will most likely add a little chicken broth. Looking forward to the left-overs. Thanks for the rcipe! I think it was a little thicker because I probably added too much chicken. I thought about adding a bit more water, but didn’t want to dilute the taste. So, perhaps the broth for next time. The bread sticks came out really good, too! Loved the rosemary. Glad they were tasty! Broth would definitely work to make it less thick. Happy to hear there will be a next time!